That’s how many food packages volunteers from across the Ohio Valley managed to put together during a recent “Hunger Challenge” event in the auxiliary gymnasium at the University of Rio Grande’s Lyne Center. The “Hunger Challenge” is a large food-packaging event, held on-site in any given community, where numerous volunteers come together for a short period of time to assemble packages of dehydrated food product to send overseas to starving children and families. Not even a HAZMAT drill in the nearby parking lot deterred the volunteers – about 80 in all — from packaging those nearly 15,000 packages filled with rice, soy, chicken stock and dehydrated vegetables into several boxes bound for destinations overseas where children face malnourishment and starvation. Pastor Thom Mollohan, of Pathway Community Church in Gallipolis, partnered with Heaven Sent Ministries in Princeton, W.Va., developers of the Hunger Challenge. Mollohan said the food is basically designed for children who are struggling with “real starvation issues” and to help them fend off disease. The batch of food that Ohio Valley volunteers helped assembled is destined for Ghana, a nation of about 25.9 million people on western Africa’s Gulf of Guinea. “It’s going to a region along the Volta River (in southeastern Ghana), where there are many people that have been struggling with different kinds of hunger issues,” Mollohan said. Mollohan said many of the children to whom the food is destined are working in forced labor situations, logging 14-hour days with little food, clothing and rest. The Hunger Challenge at URG was the first for Mollohan in the Ohio Valley, but there may be others. “From the things people have been saying to me, it’s something they hope to be able to do again, so we’re looking at the possibility of doing it again in the relatively near future,” he said. For a first-time event, Mollohan said he was impressed with the way people came together for a common cause. 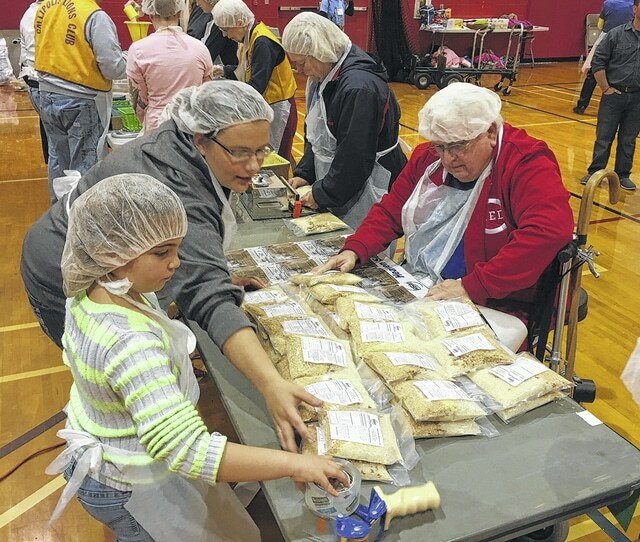 Volunteers of all ages from local churches in Gallia, Meigs and Mason counties converged on the University of Rio Grande and Rio Grande Community College gymnasium to help package nearly 15,000 ready-to-eat meals for people in starving countries. The 15,000 packs that were put together at URG are headed to Ghana, a small country in western Africa. http://aimmedianetwork.com/wp-content/uploads/sites/42/2016/03/web1_Hunger1.jpgVolunteers of all ages from local churches in Gallia, Meigs and Mason counties converged on the University of Rio Grande and Rio Grande Community College gymnasium to help package nearly 15,000 ready-to-eat meals for people in starving countries. The 15,000 packs that were put together at URG are headed to Ghana, a small country in western Africa. A young volunteer helps place labels on food packages. http://aimmedianetwork.com/wp-content/uploads/sites/42/2016/03/web1_Hunger2.jpgA young volunteer helps place labels on food packages.